On l'aime tellement qu'on l'a nommé 2 fois! We like it so much that we named it twice! UncleFOFI qui a commencé les concept bilingues bien avant la déferlante Sugar Sammy vous offre le 12 avril prochain un show exceptionnel avec 50% humour franco+ 50% humour anglo. Afin de représenter la vraie richesse de Montréal qui a tellement de langues, UncleFOFI jouera dans les 2 langues et invitera des artistes franco comme anglo. Si vous aimez les LOUIS CK, DAVE CHAPELLE, JERRY SEINFIELD et le couscous, le 12 Avril vous savez ou allez. 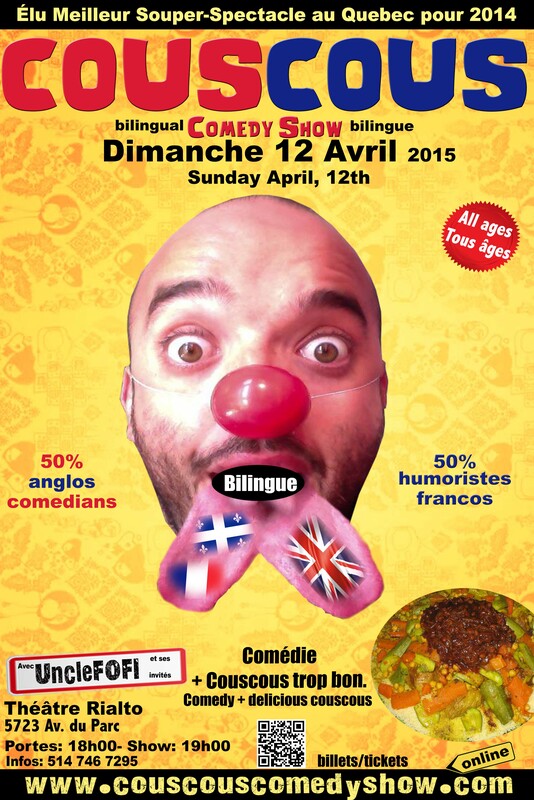 UncleFOFI who began the bilingual comedy shows concept even before the Sugar Sammy Wave is presenting next April 12th an exceptional showcase with 50% french comedy and 50% English. If you like all the Louis CKs Dave Chapelle, Jerry Seinfield as well as french comedians, next April 12th you really know to go!